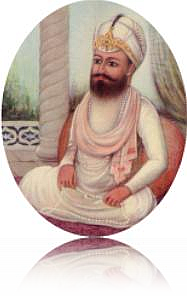 The fourth Guru, Shri Guru Ramdas Ji (Bhai Jetha Ji), was born in 1534 in a Sodhi family of Lahore (at Chuna Mandi, Lahore). His parents died when he was just seven years old and he lived with his maternal grandmother in the village Basarke. Guru Amar Das Ji found him capable and worthy of Guruship and installed him as the fourth Guru on 1st September 1574. One day Guru Amar Das Ji came to Basarke to condole with the grandmother of Guru Ram Das Ji at the passing of her son-in-law and immediately developed deep affection for Guru Ram Das Ji. Soon after this meeting Guru Ram Das Ji and his grandmother moved to Goindwal to be closer to Guru Amar Das Ji. Here he began to take part in the religious congregation held by Guru Amar Das Ji and participated in the development of Goindwal Sahib, Guru Amar Das Ji also took Guru Ram Das Ji on long missionary tours around India spreading the word of Sikhism. Guru Ram Das Ji was a man of considerable merit. He became famous for his piety, devotion, energy and eloquence. Guru Ram Das Ji laid the foundation stone of Chak Ramdas which is now called Amritsar. For this purpose he purchased land from the zamidars of the village: Tung, Gilwali and Gumtala, and began the digging of Santokhsar Sarovar. Later on he suspended the work on Santokhsar and concentrated his attention on digging the Amritsar Sarovar, Guru Ram Das Ji also had two devoted Sikhs Bhai Sahlo Ji and Baba Budha Ji who helped supervise the work. He started the construction of the famous Golden Temple at Amritsar, the holy city of the Sikhs. He laid the foundation stone of Amritsar on 13th June 1577.The temple remains open on all sides and at all times to every one. This indicates that the Sikhs believe in One God who has no partiality for any particular place, direction or time. Guru Ramdas Ji was a talented musician. He composed 638 hymns in 30 ragas and salokas in eleven raagas in the Granth Sahib. Among his famous compositions is the routine of a Sikh given in a hymn on page 305 and the Lawan, the hymns recited at every Anand Karaj-wedding ceremony. Having nominated his youngest son as the next Guru, Guru Arjan Dev Ji, Gum Ram Das Ji left Amritsar and retired to Goindwal Sahib, passing away there on 1st September 1581. The hymns recited at every Anand Karaj-wedding ceremony. Servant Nanak proclaims that, in this, the fourth round of the marriage ceremony, we have found the Eternal Lord God.